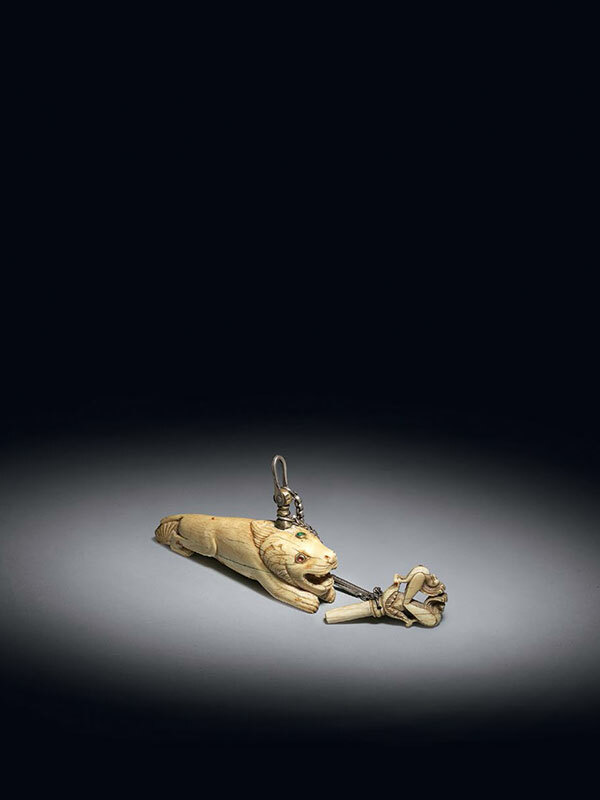 A finely-carved portable ivory gunpowder primer, depicting a jumping tiger. The mouth is wide-open, revealing large teeth and a tongue. Emerging from the open mouth is a stopper, which is decorated as a single flower head with two peacocks back to back, that also functions as an easy place to hold the stopper. Above the tiger’s lips is a stylised moustache, turning inwards in the centre towards the nose, which has distinct nostrils. The flat nose is turned upwards. The eyes, of more recent date than the ivory, are inlaid with gold and foil-backed rubies. The top of the head is inset with a single inlaid gold and foil-backed emerald, behind which distinctly close-cropped curly hair is visible. Attached to the top of the lion’s head, and drilled through, is a silver handle onto which two silver chains are attached, one between the horn and the stopper to prevent it getting lost, another to loop it around the user’s belt. The ivory has a warm, yellowish colouring.